At the club’s AGM on Tuesday 4th December, the majority of the club’s officers in 2018 were returned to their posts for 2019. With Ian Webb stepping down as the Social Members’ Representative and Richard Young not wishing to stand again as Men’s Captain, the floor duly returned Christine and Neil Biles, respectively, into those positions. Elsewhere David Armitage stood down as Weekend Friendlies Captain and passed the baton to Ian Barrett, David’s vice-captain of the past two years, whilst Paul Barrow took over as Bowls Section Treasurer from Joanna Hicks after a vote. A big, big thanks to those standing down for their efforts during 2018 and a warm welcome to those coming on-board for 2019. ‘Get on the Green!’ Highworth Bowls Club is inviting visitors to its Open Day on Saturday 13th May 2017, from around 10:30am to 3:00pm. If you’ve ever thought about trying lawn bowling, here’s your chance to get a ‘taster’ bowling session on the Highworth green. No need to book – just turn up on the day, and our members will be happy to show you the Club and talk to you about membership. Of course, you don’t have to bowl to be a member of Highworth Bowls Club. Our clubhouse and bar is open throughout the year for our social and bowling members – after bowling throughout the summer, we play short mat bowls, crib, and league skittles throughout the winter – and new members are most welcome. Members: remember to ‘bring a friend’.. The Club invites visitors to its Open Day on Saturday 12th May, from around 10:30am to 2:30pm. If you’d like to try your hand at bowling, the Club’s coaches will be on hand to give you a ‘taster’ bowling session. You’ll find that bowls is a sociable game that can be enjoyed at almost any age, and one in which partners can play at the same time, on an equal basis. And with the ever-increasing cost of travel, the Club provides a local sporting option that Highworth residents can enjoy at low cost, and with a low carbon footprint! If you haven’t visited the Club before, or if it’s been a while since you last visited, please come along and see us – Club members will be pleased to meet you and show you around. Of course, you don’t have to bowl to be a member of Highworth Bowls Club. Our clubhouse and bar is open throughout the year for our social and bowling members – new members are welcome. Why not come and see us – just turn up on the day (please bring flat-soled shoes) . The Club invites visitors to its Open Day on Sunday 23rd May, from around 10:30am to 2:30pm. If you haven’t visited the Club before, or if it’s been a while since you last visited, why not come along to take a look at the Club – members will be pleased to see you and show you around. If you’d like to try your hand at bowling, the Club’s qualified coaches will also be on hand to give you a ‘taster’ bowling session. 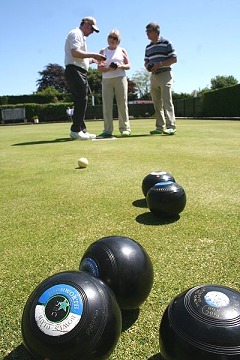 Of course, you don’t have to bowl to be a member of Highworth Bowls Club. Our clubhouse and bar is open throughout the year for our social and bowling members – and new members are welcome. Members – if you have friends, relatives or neighbours who’d enjoy Club membership, please bring them along on the day.